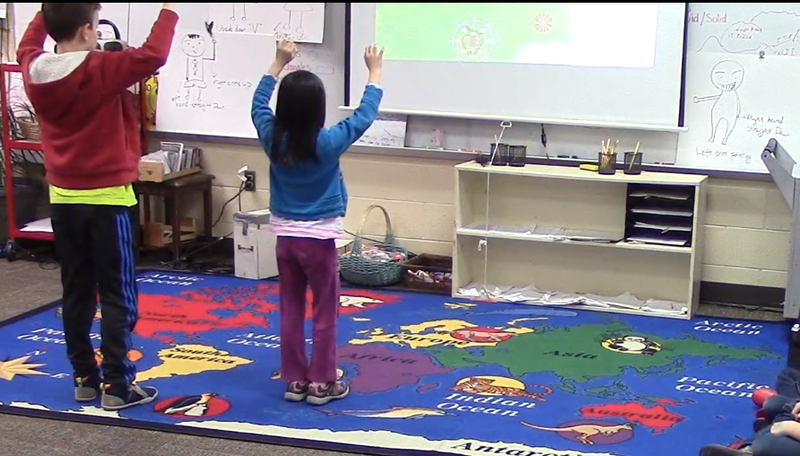 Indiana University researchers used OpenPTrack’s new object tracking and pose recognition this past spring to help first and second graders learn about the complex system of honeybee foraging. Dr. Joshua Danish from the Learning Sciences program led the research team, as part of the NSF-funded Promoting Learning through Annotation of Embodiment (PLAE) project, which engages students in embodied sociodramatic play. While being taught by their own classroom teachers, the students were enabled by OpenPTrack to explore physically how bees locate flowers and communicate these locations to the rest of their hives, and how flower placement in fields affects foraging behaviors and the amounts of food that bees can gather. Eight sessions of approximately 60 minutes were help over four weeks in March and April, with 23 first graders in one classroom and 25 second graders in another. Half of each group played as bees while the other half made notes and drawings using iPads and clipboards. As bees, the students foraged for flowers, collected nectar, and waggle danced for fellow bees inside the hive—while their classmates documented which flowers were visited, the attributes attracting bees, and the productivity of foraging patterns. Students could vote to send AI bees to particular flowers (via poses), and arrange gardens to investigate flower properties (via objects). PLAE is a continuation of Danish’s collaboration with Dr. Noel Enyedy from UCLA GSE&IS and the ongoing NSF-funded STEP and iSTEP projects, in association with UCLA REMAP.